At bea Skin Clinic, we can show you how your skin will stand the test of time with a simple cotton mouth swab. Until recently, skin specialists were unable to foresee the intrinsic, or internal factors, that influence the rate at which clients' skin ages. But thanks to the SkinDNA™ test available at bea Skin Clinic, this is now possible. Before now, DNA tests have been associated with forensic investigations, crime scene dramas and Hollywood paternity suits. Assessing your skin's genetic profile involves taking a painless saliva sample from the inside of your mouth and sending it to a special lab, who will then produce a custom report assessing your skin's innate susceptibility to conditions such as pigmentation, wrinkles, loss of elasticity and inflammation. This report will provide you and your bea Skin Clinic practitioner with a scientific foundation for accurately predicting your skin's future. If you're overwhelmed by contradicting advice given by skin care professionals, blogs and magazines, it might be easier to focus on treating the issues which make your skin genetically weak. The SkinDNA™ test gives you a glimpse into the future of your skin, helping you assess its potential long term health and plan a suitable treatment programme geared towards prevention. A DNA sample of your skin will be sent via post to SkinDNA™’s headquarters in Australia by your bea Skin Clinic practitioner. Your saliva sample will be retained by SkinDNA™ for up to seven days after it is processed, and after the DNA analysis is complete, it will be sent to the SkinDNA™ Isolation Bay where it will be incinerated. You will receive your printed results 7-10 days after taking your saliva swab at bea Skin Clinic. SkinDNA™'s research led to a remarkable discovery of 15 genetic markers that play a central role in skin protection, premature ageing and the future ageing pattern of our skin. The ability to take a skin DNA test has unleashed a new era in personalised medicine as it allows you to build your skin care regime based on your results. Once you receive your results, your bea Skin Clinic practitioner will help you analyse the results and, if you wish, we will recommend treatments or products for your specific case. SkinDNA™'s testing report will introduce information regarding your skin's genetic profile in an easy-to-understand format, using graphic displays to facilitate the understanding of more complex genetic concepts and numerical values. There is no need to retake the SkinDNA™ Test as your genes never change. Your DNA will remain the same throughout your entire life. Collect a saliva sample from your inner cheek using SkinDNA™'s easy to use DNA collector. bea Skin Clinic will post your sample to SkinDNA™'s secure testing location. SkinDNA™'s accredited ISO lab will test your DNA through several laboratory processes. 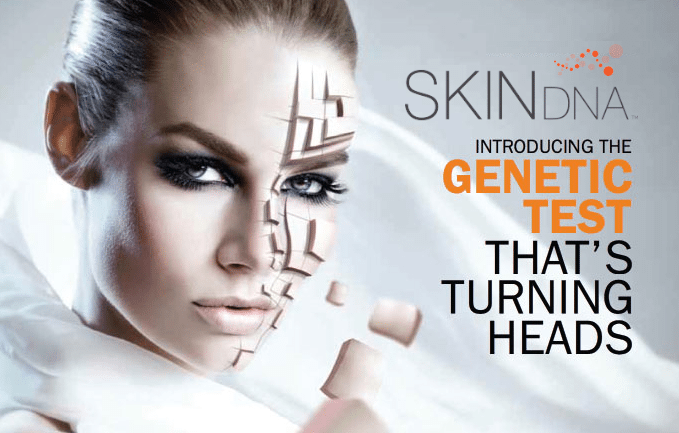 Receive your seven page SkinDNA™ report in as little as 7-10 days and discover what your DNA reveals about your skin. SkinDNA™ is a diagnostic tool which enables you, together with your bea Skin Clinic practitioner, to establish a tailor made skin regime. Your daily skin programme will - quite literally - have your name all over it!